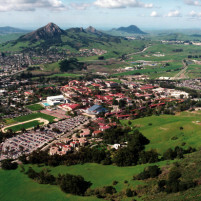 One Cal Poly student and one Cuesta College student were stabbed early Friday morning in the aftermath of a fight at a fraternity party in San Luis Obispo. Both students suffered single stab wounds to their upper torsos, according to the San Luis Obispo Police Department. Their injuries are not life threatening. Police have not yet located either of the stabbing suspects. Cal Poly is currently holding its annual Week of Welcome. The university has long been trying to curb partying during WOW Week while many incoming freshmen and aspiring Greek members try to impress fraternities and sororities. At 12:47 a.m., police received a 911 call reporting the stabbing on Foothill Boulevard near the entrance to Mustang Village. Responders treated the victims at the scene and then transported them to Sierra Vista hospital. Earlier in the night, both victims were attending an event hosted by the Alpha Gamma Rho fraternity. One of the stabbing suspects attempted to enter the event, but he was turned away because it was a private gathering. The suspect became angry and started a physical fight with one of the victims. The fight was quickly broken up, and the suspect fled. About 30 minutes later, the suspect approached both victims as they were walking on Foothill Boulevard near the entrance to Mustang Village. A second suspect also approached the victims. The suspects both started a physical fight with the victims. During the fight, the second suspect stabbed both victims in the upper torso. Both suspects fled by foot on Foothill Boulevard toward California Boulevard. The first suspect is described as a white male in his 20s with olive complexion. He is about 5 feet 6 inches tall with an average build and a dark beard. He was wearing a black shirt and blue jeans. The second suspect is also described as a white male in his 20s with olive complexion. He is about 6 feet tall and 160 pounds with dark hair. The second suspect, too, was wearing a black shirt and blue jeans. He may still be armed with a knife, police say. Investigators believe both suspects are from the Fresno area because of statements made during the attack. Gosh, Frat parties must be soooo much fun. How many bad things have to happen at Cal Poly before these things get shut down? Our kids deserve better. Mustang Village is full of students? What an atmosphere for learning. Think about it-Fresno is the car theft capital of the nation and they are responsible for much of the crime in SLO-including graffiti, burglary, and violent crimes. I have been a victim of 2 of these categories and they have been traced to Fresno. If there’d been some downtown bowling available, perhaps this night would not have been so violent. I like the new trend of describing the suspects with “olive complexions”. I am always fascinated with the new ways we try to be politically correct. Most importantly: it appears that the façade of parents sending their children to Cal Poly to be in a ‘safe environment’ is slipping pretty quickly. We saw that front and center when the young woman had someone jump out of the bushed and assault her just recently. We could build a fence around this town….but then Disney tried that a few years back in Florida and that did not work out well. (Seriously–they built this whole housing community and tried to group singles, families and seniors on the same streets–and outsiders had to be cleared at a guard gate). The government pulled the plug on that one! You cannot discriminate. Santa Barbara is the new LA (complete with deranged shooters) and this….is the new Santa Barbara…. Is Fresno the new Bakersfield, and if so does that make nipomo the new Santa Maria? Where does that leave arroyo grande? I wish this was the new SBA, our home value would be double the price! One more reason to band the useless social clubs otherwise known as fraternities. What a bunch of bums. ??? Because we know all of them are bad?? Sorry that’s as ridiculous as banning a particular flag because a single idiot decided to do something bad and used it in the background of a video he made. Instead why don’t we go after the real problem and deal with it? Not JUST this incident. When is the last time you ever heard of one of these organizations doing anything good? One story after another about frats at Cal poly getting in trouble. This incident is just another in a long line of bad stories. I am sure several fraternities do good things. As for the reason you don’t hear about it is in part because as with all media negatives sell better than positives. I would bet all the negative stories you hear about frats involves just a few and part of the reason you keep hearing them is because the university never “really” deals with the problem and why because it is bad for their business and parents might stop sending their money, I mean kids in SLO. I have never particularly liked fraternities for other reasons but your comment about never hearing of these organizations doing anything good is off-base. I have witnessed many fraternities doing volunteer work in the community (not necessarily the same ones which seem problem-prone) and would not have known about them if I hadn’t actually seen their efforts or heard about them from others I know. Like so much else in this world, you only hear about stuff that makes the news and pay attention to stuff that has emotional impact. Such stuff is mostly negative and that results in unfair generalizations and magnifies the negatives way out of proportion. Sure, let’s ban all the social clubs and the children who attend poly will immediately stop drinking, doing drugs, etc. Week of Welcome, indeed. How was the first week of school, son? It appears CalPoly has a serious issue with the safety of its students. How about the mentality of the student?. Where were these kids raised and what have they been taught? Expel them immeidately as there is no excuse for this type of behavior! Expel the students who were attacked by people attempting to trespass at a private gathering and later stalked and stabbed by them while walking home? Doesn’t sound so just to me. You are correct, if they are not students, no accountability. I must have read wrong and thought they were all students. I don’t think the suspects are students at all, it sounds like they are Fresno lowlife who came over to SLO and tried to get into a party and when they were turned down they got pissed off and knifed some students.